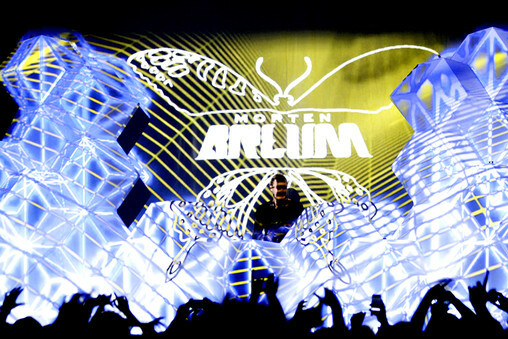 Morten Breum, the most popular Danish DJ with over 94.000 fans on Facebook, played a sold out Vega, one of my favorite venues i Copenhagen, with a capacity of 1500 on the floor and balcony in beautiful functionalist surroundings with mosaics, panels and tiles designed back in the 50's by world renowned danish architect Vilhelm Lauritzen. This was the first show back in Denmark, since he and his manager Nima Kay from I AM CRE8TIONS moved to LA to pursue an international break through. He has since been working on some new tracks and playing major nightclubs around the US, like LIV Miami and Pacha NYC. At Miami Music Week he played a couple of pool parties and I actually attended one of them on top of the Dream Hotel on Collins, but I sadly just missed him, so I was really looking forward to catch this show in Copenhagen. At Vega on April 21st, Breum displayed the excellent DJ skills, that has made him so popular in Denmark, he truly is a gifted DJ, but also a great choice of songs, with neoclassic hits like Atom by Nari & Milani, Greyhound by SHM, In My Mind by Ivan Gough & Feenixpawl, Toulouse by Nicky Romero, Calling by Ingrosso & Alesso and his new tracks Get Static and the epic Larva (get it NOW on Beatport, do it, seriously, do it). The 1500 guests sure loved it, going mental to the music. He also had a sweet stage setup with a 3D like beehive setting around the DJ booth with funky graphics being "projected" on the squares (or however they did it). Very impressive, can't wait to see him again at Summerburst in Stockholm this summer. Back in January, I wrote about him and this new track Larva and predicted that this big room banger of Avicii-like proportions, will skyrocket him into international stardom. I still believe that. The Larva has turned into a beautiful Butterfly.